Brothers: Gwyn Wale, left, with his brother Josh. A BOXER has been stabbed through the heart in a violent attack on a South Yorkshire street. Gwyn Wale, aged 27, was building a wall for a neighbour near his home on Becknoll Road, Brampton Brierlow, Rotherham, when he was attacked. The father-of-one is recovering in hospital as detectives try to find what happened and establish a motive. Officers sealed off the scene as forensic experts looked for clues. Gwyn, well known in boxing, is a light-welterweight who made his debut as a professional in 2002. Up until 2006 he had won six of his 10 contests. The builder and part-time bouncer made his comeback fight in February after a five-year absence from the ring and has a fight lined up in Doncaster next month. His brother Josh, 23 - a promising bantamweight who is due to be fighting next week - posted a message on the Facebook social networking site to tell family and friends of the attack on his brother. Gwyn’s manager Carl Greaves, a former super-featherweight world title holder, manages all the boxers at MJ’s Boxing Academy in Wombwell, including the Wale brothers. He said: “It’s a big shock and a massive shame because Gwyn was just getting back into his boxing and had a fight lined up on September 23. “The first I heard about it was when Josh rang me up on Thursday. “They are a real close-knit tight family. Josh was supposed to be in a big fight in Doncaster on September 3, but I don’t know what his state of mind will be. He’s only one or two fights away from fighting for the British title. “He could go out there and box for his brother, but obviously he shouldn’t fight if his head isn’t right. It’s a big, big decision for him and whatever he chooses I’ll back him. Fformer Wath Comprehensive pupil Gwyn trains at MJ’s Boxing Academy at Wombwell WMC. A Police spokeswoman said: “Police were called to an incident at Becknoll Road, Brampton, Rotherham, at about 3.45pm on Thursday, August 25. 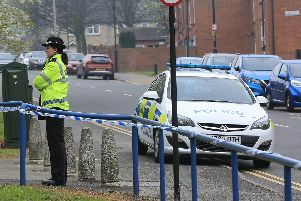 “A 27-year-old man has been taken to hospital with non-life-threatening stab wounds and is currently in a stable condition. “A 44-year-old man has been arrested in connection to this incident. * Call 0114 220 2020 and quote incident 680 of August 25 or Crimestoppers on 0800 555 111.